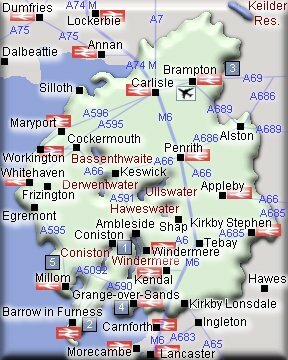 It is 91 miles from Barrow in Furness to Brampton and 81 miles from Whitehaven to Kirkby Stephen. Airport indicated is Carlisle airport. Killhope, The North of England Lead Mining Museum, Upper Weardale Tel: 01388 537505 - Winner of the 'North East England Tourism Award 2005 - Most Welcoming Experience' and 'The Guardian' Family Friendly Museum Award 2004. Killhope explores the life of North Pennine lead mining families with Park Level Mine underground experience, Northern Englands largest working water wheel and hands-on activities. Visitor Centre with shop, café and Worlds largest Spar Box exhibition. Woodland Walk. Under 7s play area. Workshops/activities. The South Tynedale Railway is a heritage railway in Cumbria and England's highest narrow gauge railway. The route runs from Alston to Kirkhaugh, Northumberland, via the South Tyne Viaduct, the Gilderdale Viaduct and the Whitley Viaduct. The current line is two and a quarter miles in length. Brougham Castle, Penrith Tel: 01768 862488 - The ruins of this 13th century fortress stand on the banks of the River Eamont, a mile and a half south of Penrith. The castle was restored by Lady Anne Clifford in the 17th century and overlaps the site of a Roman fort. Dalemain House & Gardens, Penrith CA11 0HB. Tel 01768 486450. On the A592 between the A66 and Ullswater. A Georgian facade grafted onto a largely Elizabethan house with grand public rooms and ample grounds. Hutton-in-the Forest, Penrith, Cumbria Tel: 01768 484449 - Home to Lord and Lady Inglewood, it was originally a medieval stronghold and the Pele Tower still survives. Inside and outside the house show a wide range of architectural and decorative styles from the 17th century to the present day. Hill Top, Near Sawrey, Hawkshead, Ambleside, Cumbria LA22 0LF Tel: 015394 36269 Delightful small 17th-century house where Beatrix Potter wrote many of her famous children's stories. Hill Top is managed by the National Trust. Dove Cottage / The Wordsworth Museum, Grasmere, Cumbria. LA22 9SH. Tel: 015394 35544 - Dove Cottage was the home of the Romantic poet William Wordsworth. Some seventy thousand visitors now come to see the cottage and its gardens every year. Attached to Dove Cottage, the award winning museum contains much of Wordsworth's work, as well as a collection of early watercolour paintings of the Lake District. The Horse Fair, Appleby-in-Westmorland. An annual event where every June, the Romany families of Europe  many in colourful, horse-drawn caravans  converge on nearby Gallow's Hill for this world-famous, week-long event. The fair began in 1685 when a charter was granted by James II. For many centuries, sheep and cattle were also sold at Appleby. The horses are washed in the River Eden before being shown off to prospective buyers. On the outskirts of Appleby. Appleby Castle is located in the town centre, off Boroughgate. The Norman keep was restored by Lady Anne Clifford. In the centre of Appleby. Acorn Bank Garden & Watermill, Temple Sowerby, nr Penrith, Cumbria CA10 1SP (7 miles from Appleby) Tel: 017683 61893 - Delightful sheltered garden, renowned for its herbs and orchards growing old English fruit varieties, a National Trust property. About 6 miles from Appleby. Keld Chapel is a tiny 16th-century Chapel near Shap (access at all times; key in village, see notice on chapel door). It is one of the National Trust's more remote religious sites. About 8 miles from Appleby. South Lakes Wild Animal Park, Dalton in Furness, Cumbria - Tel: 01229 466086 Europe's Top Tiger Conservation Centre, with a unique safari on foot with many animals wandering free in natural surroundings. About 4 miles north of Barrow In Furness. Barrow-in-Furness - Furness Abbey, Tel 01229 823420 Furness Abbey was one of the richest Cistercian monasteries in England, exceeded only by Fountains Abbey in Yorkshire. The red sandstone remains are in the care of English Heritage. About one and a half miles north-east of Barrow In Furness. Bow Bridge is a late-medieval stone bridge across Mill Beck that carries a route to nearby Furness Abbey. The bridge is in the care of English Heritage. About half a mile north of Barrow In Furness on a minor road off A590 near Furness Abbey. Laurel & Hardy Museum, 4c Upper Brook Street, Ulverston LA12 7BQ Tel: 01229 582292 - Ulverstons most famous son is Stan Laurel, born on 16th June 1890. The comedians' lives are celebrated in a mind-boggling collection of memorabilia believed to be the largest in the world, including letters, photographs, personal items and furniture. A large extension gives ample room to browse and a small cinema shows films and documentaries all day. Disabled persons have full access. About 7 miles northeast of Barrow In Furness. Conishead Priory and Gardens, Manjushri Centre, Ulverston - Tel 01229 584029. The Manjushrj Centre is an international Buddhist College providing a peaceful environment in which people can learn about Buddhism and meditation. Originally founded in 1160 as a hospital for the poor, it is dominated by two 100 foot octagonal towers and is an excellent example of Victorian Gothic architecture. Special features include decorative ceilings, a valted great hall with fine stained glass and a 177 feet long cloister corridor. The Oak Room contains impressive carved woodwork from the early 17th Century. About 9 miles northeast of Barrow In Furness. Piel Castle is located on Piel Island and is accessed by ferry boats from Roa Island on the outskirts of Barrow In Furness. The impressive ruins of a 14th-century castle with a massive keep, inner and outer baileys, and towered curtain walls still standing. It was built by the Abbot of Furness on the south-eastern point of Piel Island, to guard the deep-water harbour of Barrow-in-Furness against pirates and Scots raiders. The site is owned by English Heritage and is freely accessible in daylight hours. Access is from Roa Island, summer only; subject to tides and weather. About 3 miles northeast of Barrow In Furness on the A5087. Birdoswald Roman Fort, Hadrian's Wall, Brampton, Cumbria CA8 7DD Tel: 016977 47602 Birdoswald stands high above a bend in the River Irthing in one of the most picturesque settings on Hadrian's Wall. A Roman fort, turret and milecastle can all be seen on this excellent stretch of the Wall. The Birdoswald Visitor Centre provides a good introduction to Hadrian's Wall. About 6 miles northeast of Brampton. Talkin Tarn Country Park, Nr Brampton. Tel 016977 3129. A 65-acre lake set amid 120 acres of farmland and woodland, where you can sail, windsurf, canoe or hire wooden rowing boats. Fishing is available, mountain bike are for hire, there is a small camping and caravan site, and a permanent orienteering course is laid out around the park. About 2 miles south of Brampton. Lanercost Priory Church, Lanercost, Brampton, CA8 2HQ. Lanercost Priory was founded about 1166 by Henry II and fell into disrepair after the Dissolution of the Monasteries. About 1740 it was decided to restore the nave, and use it as a Parish Church. The West Front of the Church is a fine example of early English architecture. In the North aisle are three stained glass windows by Sir Edward Burne-Jones. The remainder of the Priory, second only to Furness Abbey in interest as a ruin, is now in the hands of English Heritage. About 2 miles northeast of Brampton. The Horse Fair, Appleby-in-Westmorland. An annual event where every June, the Romany families of Europe  many in colourful, horse-drawn caravans  converge on nearby Gallow's Hill for this world-famous, week-long event. The fair began in 1685 when a charter was granted by James II. For many centuries, sheep and cattle were also sold at Appleby. The horses are washed in the River Eden before being shown off to prospective buyers. Brough Castle, Cumbria - Like many other castles in this area, Brough was restored in the 17th century by Lady Anne Clifford. The Castle consists of a large mound, on which there is a range of buildings with a circular corner tower and the remnants of an older four storey keep. It is owned by English Heritage. Carlisle Castle, Carlisle Tel: 01228 591922 - a massive Border stronghold with gatehouse and keep.Take a guided tour through its maze of passages and chambers. In the centre of Carlisle. High Head Sculpture Valley, High Head Farm, Ivegill, Carlisle, Cumbria, CA4 0PJ Tel: 016974 73552 A family friendly contemporary art gallery and tearoom set on a working dairy farm, 5 acres of outdoor sculpture park and 70 acres of farm walks, with Art Gallery, Spa, Farmhouse Tea room and Sculpture Valley, with extended country walks. Life-size sculptures carved from wood, stone, iron and bronze created by internationally renowned sculptor Jonathan Stamper and other artists. About 7 miles south of Carlisle. Guildhall Museum, Green Market, Carlisle, Cumbria, CA3 8JE Restored medieval half-timbered building. Displays on civic and local history. Guild silver, city chest dated 1400, medieval pottery, civic regalia. The Guildhall is located in the city centre, a short distance from the tourist information centre. In the centre of Carlisle. The aircraft collection is based on British jet aircraft that entered service with the Royal Air Force during the 1950's and 60's. To get there from Carlisle, cross over the M6 at jct 44 and follow the signs to Carlisle Airport, which is located on A689. About 6 miles east of Carlisle. Bewcastle Cross, Demesne, Bewcastle, Carlisle, CA6 6PX Tel: 01697 748627 - An 8C Anglo-Saxon carved stone cross ( its head is missing) besides St Cuthbert's Parish Church of Bewcastle, dating from 13C set beside ruins of Bew Castle. To get there from Carlisle, take A69 to Brampton, Lanercost, up hill and turn left to Bewcastle, over crossroads and 3 cattle grids, down hill. About 15miles north of Carlisle. Leisure and exhibition centre in Carlisle offering sports facilities, recreation, arts, evening entertainment and children's activites. In the centre of Carlisle. Birdoswald Roman Fort, Hadrian's Wall, Brampton, Cumbria CA8 7DD Tel: 016977 47602 Birdoswald stands high above a bend in the River Irthing in one of the most picturesque settings on Hadrian's Wall. A Roman fort, turret and milecastle can all be seen on this excellent stretch of the Wall. The Birdoswald Visitor Centre provides a good introduction to Hadrian's Wall. About 12 miles northeast of Carlisle. Talkin Tarn Country Park, Nr Brampton. Tel 016977 3129. A 65-acre lake set amid 120 acres of farmland and woodland, where you can sail, windsurf, canoe or hire wooden rowing boats. Fishing is available, mountain bike are for hire, there is a small camping and caravan site, and a permanent orienteering course is laid out around the park. About 8 miles east of Carlisle. Lanercost Priory Church, Lanercost, Brampton, CA8 2HQ. Lanercost Priory was founded about 1166 by Henry II and fell into disrepair after the Dissolution of the Monasteries. About 1740 it was decided to restore the nave, and use it as a Parish Church. The West Front of the Church is a fine example of early English architecture. In the North aisle are three stained glass windows by Sir Edward Burne-Jones. The remainder of the Priory, second only to Furness Abbey in interest as a ruin, is now in the hands of English Heritage. About 10 miles northeast of Carlisle. Florence Mine Heritage Centre, Egremont, Cumbria Tel: 01946 825 830 The last deep working Iron Ore mine in Europe. The Centre offers a mining museum, geology & mineral room, mock drift, shop, refreshment area and a research facility. Disabled access is available throughout. About 4 miles south of Cleator Moor. Sellafield Visitors Centre Tel: 01946 727027 - Sellafield is probably BNFL's most well known site, and is home to the Sellafield Visitors Centre. About 7 miles south of Cleator Moor. Ravenglass and Eskdale Railway, Ravenglass, Cumbria. Tel: 01229 717171. The Ravenglass and Eskdale Railway runs for seven-miles from the coastal village of Ravenglass in the Western Lake District to Dalegarth station and visitor centre in Eskdale. About 13 miles south of Cleator Moor. Muncaster Castle, On the A595 near Ravenglass Tel. 01229 717614 Muncaster Castle has been home to the Pennington family since 1208. The 1800-acre estate contains 77 acres of woodland gardens, renowned for their azaleas, rhododendrons, and camellias. Muncaster is also home to the Owl Centre and World Owl Trust, with 48 species from all over the world. About 17 miles south of Cleator Moor. St Bees Head Nature Reserve - One of the largest cliff seabird colonies on the west coast of England. Birds include razorbills, kittiwakes, fulmars, guillemots, some puffins and the only black guillemots breeding in England. Cormorants, rock pipits, ravens, peregrines and stonechats on the cliffs and gannets, skuas and shearwaters offshore. You can see the Isle of Man on a clear day. About 5 miles west of Cleator Moor. The Hardknott Pass road, with a gradient of 1 in 3, is a steep narrow and winding switchback road. From the west, within one mile of leaving the pastoral valley of Eskdale, the road rises to 1291 feet. Hardknott Pass is on a minor road between the A595 on the west coast and the A593 near Skelwith Bridge in the east. At the top of the pass is Hardknott Roman Fort commanding views reaching from the upper Eskdale valley to the Isle of Man. It was the perfect site for the Romans seeking to control the area. About 18 miles southeast of Cleator Moor. Bassenthwaite Lake is one of the largest at 4 miles long and 3/4 mile wide, but also one of the shallowest at 70 ft deep. It is the most northerly of the lakes, and has no major settlements on its shores. There is a shore path which runs the length of the west shore, but there is no access to the east side except at Mirehouse. Bassenthwaite is home to the vendace, a rare and endangered fish species found only here and in Derwentwater. About 5 miles east of Cockermouth. Mirehouse is a remarkable historic house and gardens facing Bassenthwaite Lake. The gardens contain 4 wooded adventure playgrounds, varied sheltered gardens and lakeside walks through woods and parks. Here there is a small open-air theatre, built in 1974 for the reading of 'Morte d'Arthur' to the Tennyson society at the place where it is thought that Tennyson, who often stayed at Mirehouse, composed much of the poem. About 9 miles east of Cockermouth. Tel: 01900 822673. An indoor presentation of sheep sheerers at work with hands-on experience and opportunity to meet 19 different breeds of live sheep. About 1 mile south of Cockermouth. Wordsworth House, Main Street, Cockermouth, Cumbria CA13 9RX Tel: 01900 820884 - A fine Georgian town house, the birthplace and childhood home of William Wordsworth. A National Trust property with attractive walled gardens growing fruit, herbs and vegetables of the Wordsworths' time. In the centre of Cockermouth. Florence Mine Heritage Centre, Egremont, Cumbria Tel: 01946 825 830 The last deep working Iron Ore mine in Europe. The Centre offers a mining museum, geology & mineral room, mock drift, shop, refreshment area and a research facility. Disabled access is available throughout. On the outskirts of Egremont. Sellafield Visitors Centre Tel: 01946 727027 - Sellafield is probably BNFL's most well known site, and is home to the Sellafield Visitors Centre. About 4 miles south of Egremont. Tel: 01229 717171 The Ravenglass and Eskdale Railway runs for seven-miles from the coastal village of Ravenglass in the Western Lake District to Dalegarth station and visitor centre in Eskdale. About 10 miles south of Egremont. Muncaster Castle, On the A595 near Ravenglass Tel. 01229 717614 Muncaster Castle has been home to the Pennington family since 1208. The 1800-acre estate contains 77 acres of woodland gardens, renowned for their azaleas, rhododendrons, and camellias. Muncaster is also home to the Owl Centre and World Owl Trust, with 48 species from all over the world. About 14 miles south of Egremont. St Bees Head Nature Reserve - One of the largest cliff seabird colonies on the west coast of England. Birds include razorbills, kittiwakes, fulmars, guillemots, some puffins and the only black guillemots breeding in England. Cormorants, rock pipits, ravens, peregrines and stonechats on the cliffs and gannets, skuas and shearwaters offshore. You can see the Isle of Man on a clear day. About 3 miles west of Egremont. The Hardknott Pass road, with a gradient of 1 in 3, is a steep narrow and winding switchback road. From the west, within one mile of leaving the pastoral valley of Eskdale, the road rises to 1291 feet. Hardknott Pass is on a minor road between the A595 on the west coast and the A593 near Skelwith Bridge in the east. At the top of the pass is Hardknott Roman Fort commanding views reaching from the upper Eskdale valley to the Isle of Man. It was the perfect site for the Romans seeking to control the area. About 15 miles southeast of Egremont. Dove Cottage / The Wordsworth Museum, Grasmere, Cumbria. LA22 9SH. Tel: 015394 35544 - Dove Cottage was the home of the Romantic poet William Wordsworth. Some seventy thousand visitors now come to see the cottage and its gardens every year. Attached to Dove Cottage, the award winning museum contains much of Wordsworth's work, as well as a collection of early watercolour paintings of the Lake District. In the centre of Grasmere. Lake Windermere is the largest natural lake in England, according to Wordsworth "None of the other Lakes unfold so many fresh beauties". Rowboats are available for hire, with stylish steamers and vintage cruisers to Lakeside in the south and Waterhead at the northern end. There is a ferry service across the lake to Sawrey giving access to the western side of the lake and Beatrix Potter's former home at Hill Top. About 5 miles south of Grasmere. Hill Top, Near Sawrey, Hawkshead, Ambleside, Cumbria LA22 0LF Tel: 015394 36269 Delightful small 17th-century house where Beatrix Potter wrote many of her famous children's stories. Hill Top is managed by the National Trust. About 8 miles south of Grasmere. ARMITT LIBRARY & MUSEUM, AMBLESIDE Tel: 015394 31212 - a unique place combining Library and Museum, scholarship and fun, art and entertainment. A superb collection of books and manuscripts, drawings and paintings, memorabilia and archaeological objects relating to an extraordinary gallery of famous Lake District characters. About 3 miles east of Grasmere. Townend, Troutbeck, Windermere, Cumbria LA23 1LB Tel: 015394 32628 - A well-preserved 17th century yeoman farmer's house, complete with original furniture and decorative woodwork., a National Trust property. About a mile and a half southeast of Grasmere. Rydal Mount and Gardens, Rydal, Near Ambleside, Cumbria, LA22 9LU. Tel: 015394 33002 - The Wordsworth Family moved into Rydal Mount in 1813 and rented the house continually for 46 years until the death of Mary Wordsworth in 1859. Rydal Mount was the largest house the Wordsworths lived in and became a much-loved family home. About 3 miles east of Grasmere. Florence Mine Heritage Centre, Egremont, Cumbria Tel: 01946 825 830 The last deep working Iron Ore mine in Europe. The Centre offers a mining museum, geology & mineral room, mock drift, shop, refreshment area and a research facility. Disabled access is available throughout. About 7 miles northwest of Holmrook. Sellafield Visitors Centre Tel: 01946 727027 - Sellafield is probably BNFL's most well known site, and is home to the Sellafield Visitors Centre. About 5 miles northwest of Holmrook. Ravenglass and Eskdale Railway, Ravenglass, Cumbria. Tel: 01229 717171 The Ravenglass and Eskdale Railway runs for seven-miles from the coastal village of Ravenglass in the Western Lake District to Dalegarth station and visitor centre in Eskdale. About 3 miles south of Holmrook. Muncaster Castle, On the A595 near Ravenglass Tel. 01229 717614. Muncaster Castle has been home to the Pennington family since 1208. The 1800-acre estate contains 77 acres of woodland gardens, renowned for their azaleas, rhododendrons, and camellias. Muncaster is also home to the Owl Centre and World Owl Trust, with 48 species from all over the world. About 4 miles south of Holmrook. The Hardknott Pass road, with a gradient of 1 in 3, is a steep narrow and winding switchback road. From the west, within one mile of leaving the pastoral valley of Eskdale, the road rises to 1291 feet. Hardknott Pass is on a minor road between the A595 on the west coast and the A593 near Skelwith Bridge in the east. At the top of the pass is Hardknott Roman Fort commanding views reaching from the upper Eskdale valley to the Isle of Man. It was the perfect site for the Romans seeking to control the area. About 7 miles east of Holmrook. Brougham Castle, Penrith Tel: 01768 862488 - The ruins of this 13th century fortress stand on the banks of the River Eamont, a mile and a half south of Penrith. The castle was restored by Lady Anne Clifford in the 17th century and overlaps the site of a Roman fort. About 15 miles from Keswick . Dalemain House & Gardens, Penrith CA11 0HB. Tel 01768 486450. On the A592 between the A66 and Ullswater. A Georgian facade grafted onto a largely Elizabethan house with grand public rooms and ample grounds. About 13 miles from Keswick . Castlerigg Stone Circle, Cumbria - Castlerigg is one of the most beautiful stone circles in Britain, set in a splendid position in an open field surrounded by the Lake District's mountains. It is thought to be one of the earliest circles in Britain and dates from around 3000 BC. Its 38 stones are placed in an slightly oval shape of 30m (100ft) in diameter. About 2 miles from Keswick . Keswick makes a good base for exploring beautiful Borrowdale, the start of many walking routes to the central peaks around Scafell and Scafell Pike, the highest in England at 3205ft and Great Gable, one of the finest looking mountains. Also accessible from Keswick is Hellvelyn at 3117ft, with the knife-edge Striding Edge providing one of the best-known scrambles in the Lake District. Mirehouse is a remarkable historic house and gardens facing Bassenthwaite Lake. The gardens contain 4 wooded adventure playgrounds, varied sheltered gardens and lakeside walks through woods and parks. Here there is a small open-air theatre, built in 1974 for the reading of 'Morte d'Arthur' to the Tennyson society at the place where it is thought that Tennyson, who often stayed at Mirehouse, composed much of the poem. About 5 miles north of Keswick. Devils Bridge, Kirkby Lonsdale, Cumbria. Devils Bridge is a beautiful three-arched 14th Century bridge that spans the River Lune near Kirkby Lonsdale, and is one of the most photographed bridges in the North of England. The bridge is so named because of the legend that it was constructed by Satan himself. Location: On the outskirts of Kirkby Lonsdale. Ingleborough is a peak in the Yorkshire Dales. It is one of the so-called Three Peaks, the other two being Whernside and Pen-y-ghent. There are several popular routes to its summit. The most frequently-used starting point is the village of Ingleton, just 5 miles southeast of Kirkby Lonsdale. The Horse Fair, Appleby-in-Westmorland. An annual event where every June, the Romany families of Europe  many in colourful, horse-drawn caravans  converge on nearby Gallow's Hill for this world-famous, week-long event. The fair began in 1685 when a charter was granted by James II. For many centuries, sheep and cattle were also sold at Appleby. The horses are washed in the River Eden before being shown off to prospective buyers. About 10 miles northwest of Kirkby Stephen. Brough Castle, Cumbria - Like many other castles in this area, Brough was restored in the 17th century by Lady Anne Clifford. The Castle consists of a large mound, on which there is a range of buildings with a circular corner tower and the remnants of an older four storey keep. It is owned by English Heritage. About 4 miles north of Kirkby Stephen. Lakeside & Haverthwaite Railway Co. Ltd, Haverthwaite Station, Nr Ulverston, Cumbria LA12 8AL Tel: 015395 31594 - Haverthwaite Station is situated on the A590 near Newby Bridge. Lakeside Station is at the southern end of Windermere. LAKELAND MOTOR MUSEUM, HOLKER HALL & GARDENS, Cark-in-Cartmel, Grange-over-Sands, South Lakeland, Cumbria LA11 7PL Tel: 015395 58509 - 30,000 exhibits including the largest display of automobilia on public display within the UK, with a full sized detailed replica of Sir Malcolm Campbell's 1935 Bluebird Car. About 6 miles south of Newby Bridge. Cartmel Priory Gatehouse, The Square, Cartmel, Grange-over-Sands, Cumbria LA11 6QB Tel: 01524 701178 A 14th-century gatehouse of a medieval priory. About 6 miles south of Newby Bridge. Cartmel Racecourse, Cartmel, Grange-over-Sands, Cumbria LA11 6QF - Tel:01539 536340 (www.cartmel-racecourse.co.uk) The course at Cartmel is a left handed oval of about one mile one furlong, which is bisected by the finishing straight. The run in at just over four furlongs is the longest in the country. Although racing currently takes place on six days of the year, the event is always well attended. About 6 miles south of Newby Bridge. The Horse Fair, Appleby-in-Westmorland. An annual event where every June, the Romany families of Europe  many in colourful, horse-drawn caravans  converge on nearby Gallow's Hill for this world-famous, week-long event. The fair began in 1685 when a charter was granted by James II. For many centuries, sheep and cattle were also sold at Appleby. The horses are washed in the River Eden before being shown off to prospective buyers. About 8 miles south of Orton. Appleby Castle is located in the town centre, off Boroughgate. The Norman keep was restored by Lady Anne Clifford. About 8 miles south of Orton . Keld Chapel is a tiny 16th-century Chapel near Shap (access at all times; key in village, see notice on chapel door). It is one of the National Trust's more remote religious sites. About 5 miles north of Orton. Brougham Castle, Penrith Tel: 01768 862488 - The ruins of this 13th century fortress stand on the banks of the River Eamont. The castle was restored by Lady Anne Clifford in the 17th century and overlaps the site of a Roman fort. About a mile and a half south of Penrith . Dalemain House & Gardens, Penrith CA11 0HB. Tel 01768 486450. On the A592 between the A66 and Ullswater. A Georgian facade grafted onto a largely Elizabethan house with grand public rooms and ample grounds . About 3 miles from Penrith . Hutton-in-the Forest, Penrith, Cumbria Tel: 01768 484449 - Home to Lord and Lady Inglewood, it was originally a medieval stronghold and the Pele Tower still survives. Inside and outside the house show a wide range of architectural and decorative styles from the 17th century to the present day. About 4 miles north of Penrith . Penrith is dominated by Beacon Fell, a rich red sandstone outcrop. The red sandstone was used for many of the buildings in the town and is a characteristic of Penrith, in contrast to the grey stone of many of the towns and villages of southern Lakeland. Westmorland Motor Museum, Rellandsgate, Kings Meaburn, Penrith, Cumbria CA10 3BT Tel: 01931 714 624. The Museum is between Penrith and Appleby, south of the A66. Restored and unrestored trucks and a collection of Automobilia. About 5 miles from Penrith . Acorn Bank Garden & Watermill, Temple Sowerby, nr Penrith, Cumbria CA10 1SP Tel: 017683 61893 - Delightful sheltered garden, renowned for its herbs and orchards growing old English fruit varieties, a National Trust property. About 5 miles from Penrith . Brougham Castle, Penrith Tel: 01768 862488 - The ruins of this 13th century fortress stand on the banks of the River Eamont. The castle was restored by Lady Anne Clifford in the 17th century and overlaps the site of a Roman fort. About 8 miles north of Shap. Westmorland Motor Museum, Rellandsgate, Kings Meaburn, Penrith, Cumbria CA10 3BT Tel: 01931 714 624. The Museum is between Penrith and Appleby, south of the A66. Restored and unrestored trucks and a collection of Automobilia. About 8 miles from Shap . Keld Chapel is a tiny 16th-century Chapel near Shap (access at all times; key in village, see notice on chapel door). It is one of the National Trust's more remote religious sites. About 2 miles from Shap . Acorn Bank Garden & Watermill, Temple Sowerby, nr Penrith, Cumbria CA10 1SP Tel: 017683 61893 - Delightful sheltered garden, renowned for its herbs and orchards growing old English fruit varieties, a National Trust property. About 9 miles from Shap. The Horse Fair, Appleby-in-Westmorland. An annual event where every June, the Romany families of Europe  many in colourful, horse-drawn caravans  converge on nearby Gallow's Hill for this world-famous, week-long event. The fair began in 1685 when a charter was granted by James II. For many centuries, sheep and cattle were also sold at Appleby. The horses are washed in the River Eden before being shown off to prospective buyers. About 9 miles from Shap. South Lakes Wild Animal Park, Dalton in Furness, Cumbria - Tel: 01229 466086 Europe's Top Tiger Conservation Centre, with a unique safari on foot with many animals wandering free in natural surroundings. About 4 miles west of Ulverston. Barrow-in-Furness - Furness Abbey, Tel 01229 823420 Furness Abbey was one of the richest Cistercian monasteries in England, exceeded only by Fountains Abbey in Yorkshire. The red sandstone remains are in the care of English Heritage. About 5 miles southwest of Ulverston. Bow Bridge is a late-medieval stone bridge across Mill Beck that carries a route to nearby Furness Abbey. The bridge is in the care of English Heritage. About 5 miles southwest of Ulverston on a minor road off A590 near Furness Abbey. Laurel & Hardy Museum, 4c Upper Brook Street, Ulverston LA12 7BQ Tel: 01229 582292 - Ulverstons most famous son is Stan Laurel, born on 16th June 1890. The comedians' lives are celebrated in a mind-boggling collection of memorabilia believed to be the largest in the world, including letters, photographs, personal items and furniture. A large extension gives ample room to browse and a small cinema shows films and documentaries all day. Disabled persons have full access. In the centre of Ulverston. Conishead Priory and Gardens, Manjushri Centre, Ulverston - Tel 01229 584029. The Manjushrj Centre is an international Buddhist College providing a peaceful environment in which people can learn about Buddhism and meditation. Originally founded in 1160 as a hospital for the poor, it is dominated by two 100 foot octagonal towers and is an excellent example of Victorian Gothic architecture. Special features include decorative ceilings, a valted great hall with fine stained glass and a 177 feet long cloister corridor. The Oak Room contains impressive carved woodwork from the early 17th Century. About 2 miles south of Ulverston. Hoad Monument, Ulverston. Hoad Monument is Ulverstons most famous landmark. Erected in 1850 on Hoad Hill, it commemorates Sir John Barrow, a founder member of the Royal Geographical Society and an explorer. It is sometimes referred to as the Sir John Barrow Monument and is a replica of Eddystone Lighthouse. It is open to the public during the summer, if the flag is flying, and is well worth a visit if only for the magnificent views of Morecambe Bay and the Lake District. About 1 mile northeast of Ulverston. High Head Sculpture Valley, High Head Farm, Ivegill, Carlisle, Cumbria, CA4 0PJ Tel: 016974 73552 A family friendly contemporary art gallery and tearoom set on a working dairy farm, 5 acres of outdoor sculpture park and 70 acres of farm walks, with Art Gallery, Spa, Farmhouse Tea room and Sculpture Valley, with extended country walks. Life-size sculptures carved from wood, stone, iron and bronze created by internationally renowned sculptor Jonathan Stamper and other artists. About 10 miles east of Wigton. Carlisle Castle, Carlisle Tel: 01228 591922 - a massive Border stronghold with gatehouse and keep.Take a guided tour through its maze of passages and chambers. About 9 miles northeast of Wigton. Hutton-in-the Forest, Penrith, Cumbria Tel: 01768 484449 - Home to Lord and Lady Inglewood, it was originally a medieval stronghold and the Pele Tower still survives. Inside and outside the house show a wide range of architectural and decorative styles from the 17th century to the present day. About 12 miles southeast of Wigton.